Of all the people in Donald Trump’s White House to publicly embarrass themselves thus far, press secretary Sean Spicer might be front and center. He’s been caught constantly lying, he yells at reporters, he keeps accidentally posting his own password on Twitter, and he’s hilariously in over his head. So when it came time for Saturday Night Live to to skewer him tonight, they decided he would be portrayed by… Melissa McCarthy. 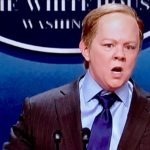 Buried under a wig that made her barely recognizable, Melissa McCarthy took the White House briefing room podium on SNL just after midnight in order to lampoon bumbling press secretary Sean Spicer. The sketch consisted of Spicer angrily demanding that reporters apologize before they could even ask a question, comically lying about the events of the past two weeks, holding up a turd to emphasize his point, and eventually getting so frustrated that he began shooting a water pistol at various reporters in the audience. That was right around the time Trump’s Secretary of Education nominee Betsy DeVos took the podium and began giving her trademark stupid answers to basic questions. The CNN White House reporter was revealed to be in a cage as punishment, and at one point Sean Spicer returned and picked up his podium and began ramming it into the reporters he didn’t like. Melissa McCarthy ended up being the perfect Saturday Night Live casting for Sean Spicer, though we doubt he’ll think so. Then again, he may not even get that he was being made fun of. Earlier this week, after satire site The Onion posted something accusing Spicer’s official job title of being to lie for Trump, a clueless Spicer retweeted it and seemed to think it was praising him. Thus far Spicer has yet to tweet anything about SNL; his most recent tweet was to yell at a reporter.